A favorite holiday nighttime spectacular is returning to Disney’s Hollywood Studios®! Led by Wayne and Lanny from ABC/Walt Disney Animation Studios’ animated special “Prep & Landing,” Jingle Bell, Jingle BAM! features state-of-the-art projections, special effects and fireworks on and around the Chinese Theater. The show will take place Nov. 8 – Jan. 6, 2019! No details have been announced regarding if the Jingle Bell, Jingle BAM! Holiday Dessert Party will return this year or not. Disney’s Hollywood Studios® is continuing one of our favorite special ticketed dining events inside the Sunset Showcase venue through January 2017! 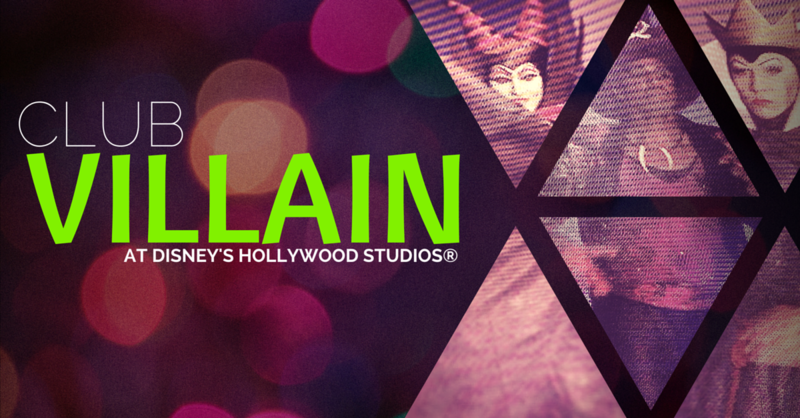 Club Villain, hosted by Dr. Facilier, is a mix of themed food, drinks, performances and encounters with some of Disney’s greatest villains – including Maleficent, the Evil Queen, Queen of Hearts, and Cruella De Vil. A house DJ is on hand to keep the party going between the spellbinding stage shows. You’ll enjoy some decadent New Orleans delicacies like tender beef striploin rubbed with herbes de Provence, Voodoo sticky “pig wings” with citrus gremolata and spicy shrimp sautéed with Andouille sausage, tomato, okra and onions over creamy polenta. Specialty alcoholic drinks plus beer and wine will also be available to guests over 21. Availability for these events are limited and will go quickly, so contact your Magic Maker® today! 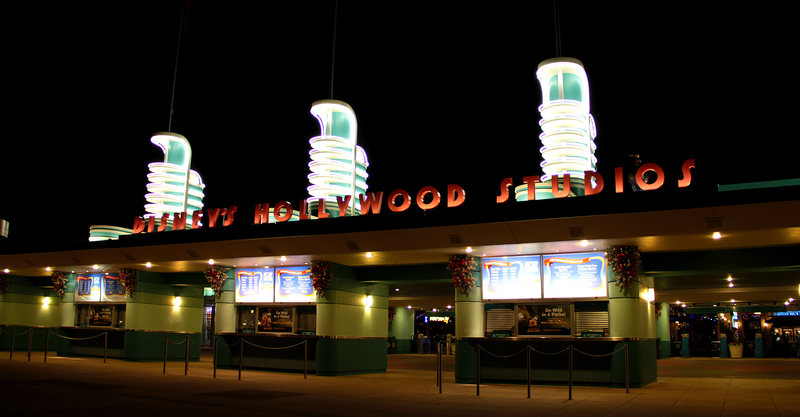 Separate admission to Disney’s Hollywood Studios® is required, and is not included in the price of this package. Club Villain will be offered on select evenings only. Please check with your Magic Maker® for specific dates and times, as operating hours may vary. This event will offer banquet style seating, so you may be seated with other parties. Entertainment is subject to change or cancellation without notice. Guests must be 21 years of age or older to consume alcoholic beverages. A valid form of government identification will be required to verify age. This offer may not be combined with any other discounts or promotions. Disney dining plan entitlements may not be redeemed for this event. 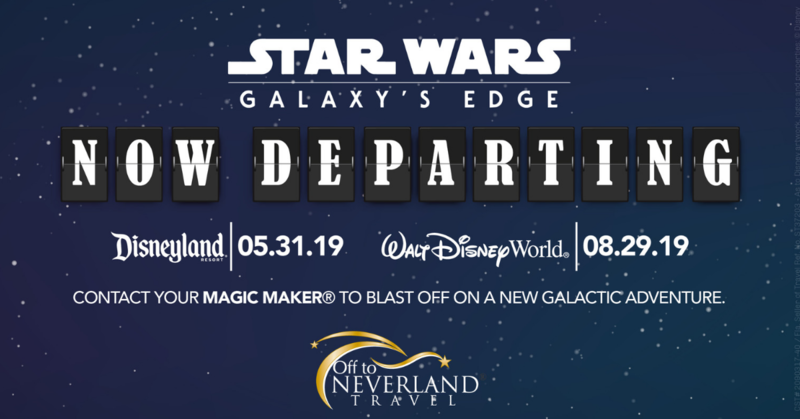 Earlier today, we told you about a new Star Wars™-themed land that is coming to both Disneyland® Park and Disney’s Hollywood Studios® (Click here for more details). 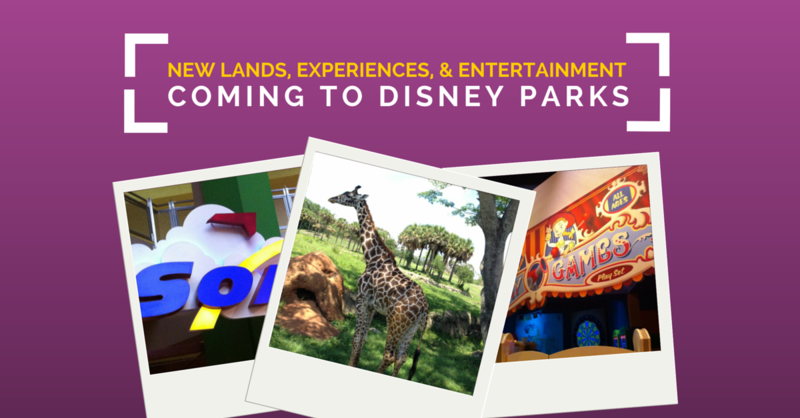 Well, we have more exciting news to share about other new lands, entertainment, and experiences coming soon to the domestic Disney Parks. Get ready to head “to infinity and beyond” as you step into the world of one of Disney•Pixar’s most famous films, Toy Story! As you enter Toy Story Land, you’ll be shrunk to the size of Woody and Buddy as you wander through Andy’s oversized toys. A family-friendly roller coaster enjoyed on the back of Slinky Dog. Alien saucer attraction in which the little green aliens take guests around for a spin. Addition of a 3rd track for the current Toy Story Mania® attraction! As announced previously, work continues on the largest expansion in the park’s history. Soon, guests will be immersed into the world of Pandora, and the entire park will transform after dark with new nighttime entertainment experiences! Scheduled to debut in Spring 2016, “Rivers of Light” will bring the Discovery River to life with live music, floating lanterns, swirling animal imagery and water screens unlike anything ever seen in a Disney Park. Kilimanjaro Safaris® will be expanded next Spring to include a new nighttime adventure. Keep watch for two new species to the attraction – African wild dogs and hyenas! Work continues on Pandora – The World of AVATAR. This new land will include floating mountains, a bioluminescent forest, and a new E-ticket attraction called AVATAR Flight of Passage. Renew your passport because Soarin’ Around the World is replacing Soarin’® in 2016 at Epcot® and Disney California Adventure®! Your journey will take you above some of the world’s most unique natural landscapes and man-made wonders. Here’s a behind the scenes look at the making of Soarin’ Around the World! There’s so much magic in store for Disney Parks in the years to come! We can’t wait to bring you all the details as they are announced and help you plan your vacations to experience it all! 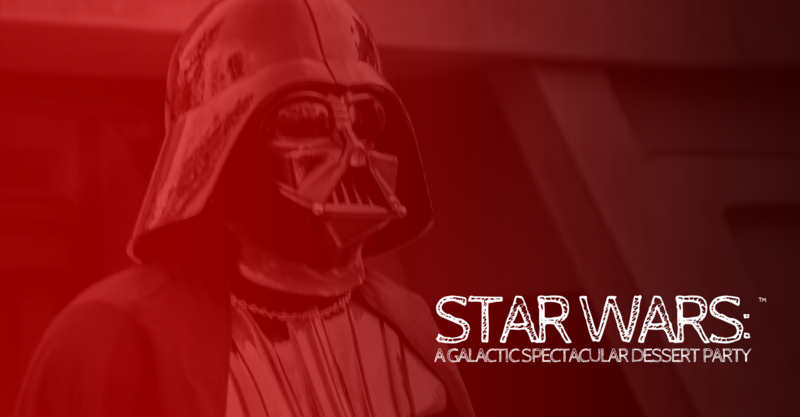 The coolest event of the Summer is back at Disney’s Hollywood Studios®! *Frozen Fireworks Spectacular will not be shown on 7/4 and 7/15. 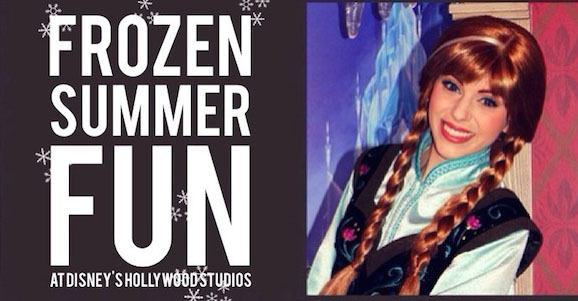 “Frozen Summer Fun – Live” is included with standard park admission to Disney’s Hollywood Studios®. Throughout this special event, Anna and Elsa will also continue to meet and greet guests at Princess Fairytale Hall in Magic Kingdom® Park. Last month, Walt Disney World® Resort announced the return of “Frozen Summer Fun – Live at Disney’s Hollywood Studios®.” Starting today, bookings for the premium package are available giving you VIP access to three of its most anticipated activities! Discounts do not apply. Park admission is required. Subject to restrictions and change without notice. 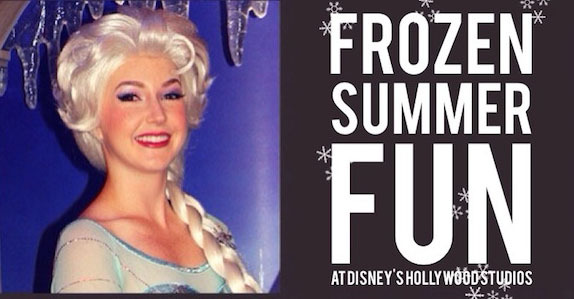 The Frozen Summer Fun Premium Package provides a reserved viewing area but no seating is available for Anna & Elsa’s Royal Welcome procession or the Frozen Fireworks Dessert Party . 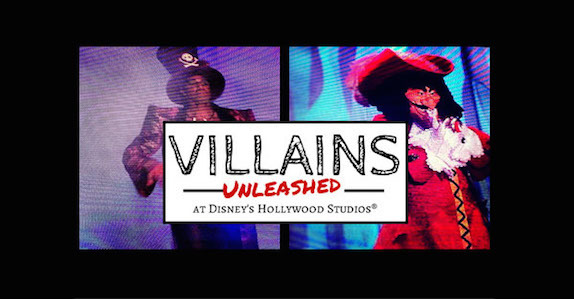 This Saturday, August 23, more than 50 Disney Villains will take over the operations of Disney’s Hollywood Studios® for a Villains Unleashed special ticketed event! Although the party doesn’t start until 8p, tickets become valid starting at 5p for admission. We suggest arriving early and enjoying a few of your favorite attractions before the party begins! On your way into the park, be sure to pick up an event guide. This will give you a listing of all the locations and times for the special activities. The party will kick off at Hades Hangout (Sorcerer Hat stage) at 8p. Villain character greetings will be spread throughout the park. Take note of which Villain the queue is for and any posted appearance times. Not all of the Villains will offer meet and greet opportunities. Fantasmic! will feature a special pre-show featuring the Night Crawlers. Don’t be late! Villainy in the Sky will start at 12:45am. As with all fireworks shows at Disney’s Hollywood Studios®, preferred viewing is in front of the Sorcerer Hat and along Hollywood Blvd. Standing back so you are not too close to the Sorcerer Hat but near one of the video screens hanging on Hollywood Blvd usually provides the best experience. 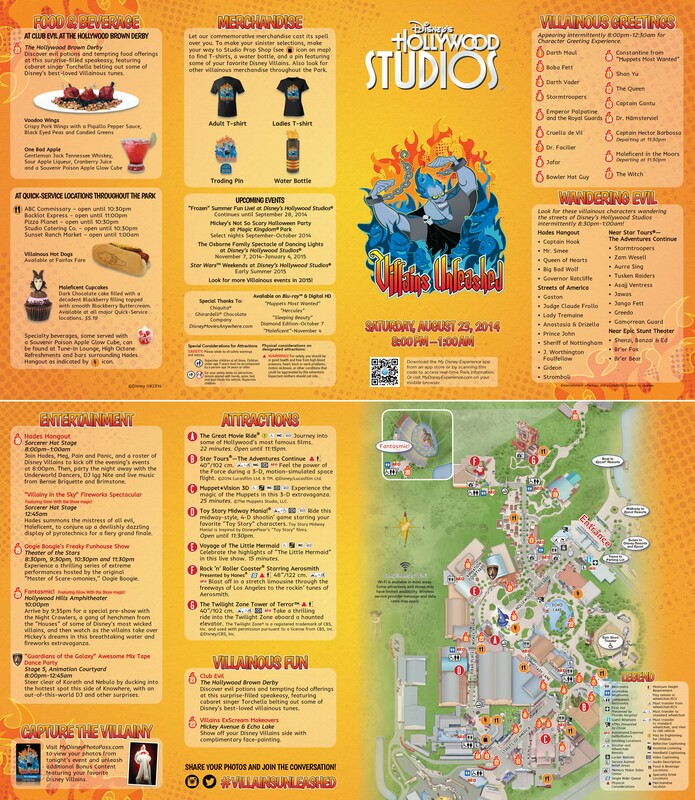 For additional information on entertainment offerings, click the image to the right to view the complete event guide. Our guests staying onsite at a Walt Disney World® Resort hotel can utilize the Disney Transportation System to get to and from the party. For those driving, the side entrance (across from the Hess Station on E Buena Vista Dr.) will close at 3p. If you are driving to the park after that time, you will need to utilize the main entrance off US-192 and World Drive. If you are going to be visiting the Walt Disney World® Resort this weekend and don’t have tickets to the event, they are still available! Pricing is $67+tax for adults / $62+tax for children. The always popular (and equally entertaining) Comedy Warehouse Holiday Special will be returning this year to Disney’s Hollywood Studios®! The show will be performed several times daily from Dec. 21, 2013 – Jan. 5, 2014 inside the Premier Theater in the Streets of America section of the park. The interactive improv show has been added to the lineup at Disney’s Hollywood Studios® for the past two years to help with the larger holiday crowds. The shows are family friendly and feature several alumni from the former Comedy Warehouse on Downtown Disney® Pleasure Island. Schedule is subject to change. See Times Guide for more details. This year’s performances are part of the new Fastpass+ service. You may reserve a seat at a show using one of your two B-tiered Fastpass+ entitlements. Contact your Magic Maker® for more details. Walt Disney World® Resort has always been a place full of laughter. From entertainment to rides, and everything in between, smiles are not a rarity when you are on property! However, on September 27th, 2008 Walt Disney World® Resort lost one of their ‘laughter’ staples when Downtown Disney® Pleasure Island area closed all of their nightclubs. In doing so, Comedy Warehouse opened their doors for a final time. Comedy Warehouse was a nightclub at Downtown Disney® Pleasure Island that featured an improv comedy troupe. It was originally the home to the parody show “Forbidden Disney”; before introducing the improve comedy troupe to keep things fresh. Last year, fans of the former Comedy Warehouse were given a special treat at Disney’s Hollywood Studios™ as the cast reunited for a special show that ran for 7 days called “The Comedy Warehouse Holiday Special”. The special show was met by capacity crowds every day. Now, Comedy Warehouse fans have something else to look forward to, and it is something you won’t want to miss even if this is your first introduction to the improv comedy troupe. 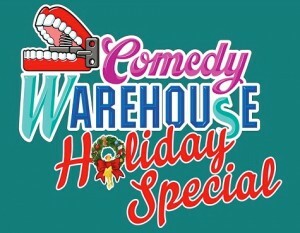 “The Comedy Warehouse Holiday Special” is returning to Disney’s Hollywood Studios™ again this year! Sure, there are plenty of things to make you smile and laugh at Walt Disney World® Resort, but this show is a must for the whole family! “The Comedy Warehouse Holiday Special” will be returning to Disney’s Hollywood Studios™ at the end of this year, and this time for an extended 14 days! The show will run from December 23rd through January 5th in the Premier Theatre. The best part? “The Comedy Warehouse Holiday Special” is included in your regular Disney’s Hollywood Studios™ park admission! Now that’s nothing to laugh about! If you are heading to Walt Disney World® Resort during the busy Christmas season, this is one ‘must’ that you don’t want to miss. And if you are looking for another ‘excuse’ to head to Walt Disney World® Resort, well you are welcome! Our Magic Makers® are ready to help you get there!